Sinclair is excited to have the opportunity to provide students with financial assistance and is now accepting applications for our 2019 scholarship. 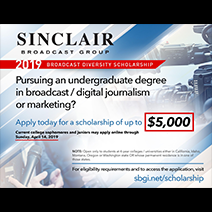 The Sinclair Broadcast Diversity Scholarship Fund was established in 2016 to provide financial support to college students interested in broadcasting, journalism, and marketing. The Fund plans to award up to 10 scholarships of up to $5,000 each per year for the next ten years to students from under-represented minority groups who need financial assistance to complete their education. Deadline to Apply: 11:59pm ET on Sunday, April 14th, 2019. 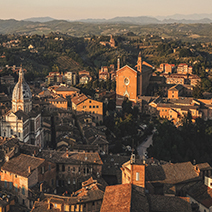 The scholarship is only open to students attending a 4-year university, or students with a permanent address in the following 5 states: California, Washington, Oregon, Idaho, Montana. 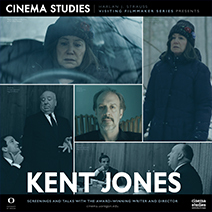 The University of Oregon Department of Cinema Studies proudly welcomes award-winning filmmaker Kent Jones to campus for the fourth annual Harlan J. Strauss "Visiting Filmmaker Series." 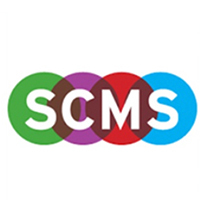 The Department of Cinema Studies is proud to congratulate Priscilla Peña Ovalle, Cinema Studies associate professor and department head, as the 2019 President-Elect for the Society for Cinema and Media Studies, the leading scholarly organization in the United States dedicated to promoting a broad understanding of film, television, and related media through research and teaching grounded in the contemporary humanities tradition. The new term will begin July 1, 2019. Call for Submissions: 3rd Annual Pacific Northwest Ethnic Studies Undergraduate Research Symposium. 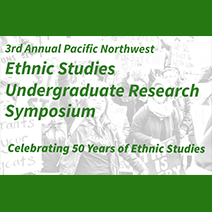 *Deadline to register has now been extended to March 8th at 5:00 p.m.
Read more about Call for Submissions: 3rd Annual Pacific Northwest Ethnic Studies Undergraduate Research Symposium. 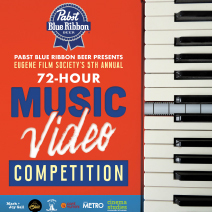 From April 11-14, regional filmmakers and musicians will compete to produce the best music video within 72 hours, incorporating a mandated creative element and prop. Films submitted by deadline will be screened by a jury of media professionals and a public audience on April 28. The film selected "Jury Award" winner will receive a $777 cash prize, and the film voted "Audience Award" winner at the screening event will also receive a $333 cash prize. The competition will be held April 11-14, 2019 and the sreening will be held April 28th at LCC's Ragozzino Hall. Registration begins February 25, 2019. Read below for more information and course descriptions! 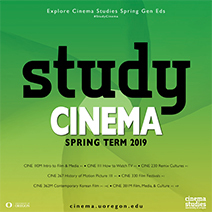 Read more about Study Cinema Spring 2019! 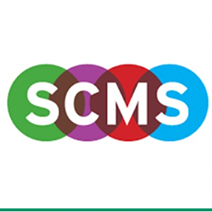 The seventh annual SCMS Undergraduate Conference invites undergraduate students from Film Studies, Media Studies or related disciplines to propose papers representing their best work in cinema and media studies. One of Variety’s 10 directors to watch for 2019. 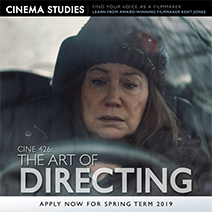 Taught by Cinema Studies Instructor Masami Kawai, this spring term course features lectures by Kent Jones, writer and director of Diane (2018), Hitchcock/Truffaut (2015), and A Letter to Elia (2010). Did You Write an Outstanding Essay? A financial award of up to $500 will be given to the top recipients! 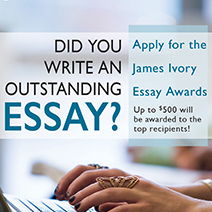 The James Ivory Essay Awards recognize undergraduate students who demonstrate extraordinary skill and creativity of research and writing in their term papers. Papers will be accepted from a course taught in S18, F18, or W19! Read more about Did You Write an Outstanding Essay?